These printers delivery an accuracy of 0.025 – 0.05mm per 25mm of part dimension and very fast printing speeds. Each printer is delivered with the 3D Manage software that enables easy build job setup, build optimization tools, parts stacking and nesting, and job monitoring. ProJet® 6000 MP The ProJet 6000 MP is the perfect technology for the growing field of digital dentistry and computer-aided medical applications. 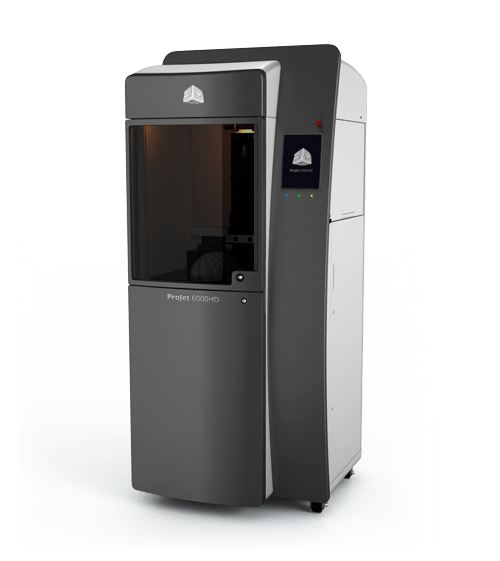 Using SLA 3D printing technology, the industry’s first and most advanced additive manufacturing, the ProJet 6000 MP offers dental and medical professionals the opportunity to mass manufacture medical devices such as custom hearing aid shells as end-use parts, or dental scans for wax up work. The ProJet 6000 stereolithography technology delivers very fine feature detail, with high accuracy and repeatability, to enable exceptional study models. With materials that are certified for USP Class VI, medical professionals can be confident that 3D prints from the ProJet 6000 are perfect in fit, form and function.